The Otter Brook Pond Trail travels over 10 miles from Kenwells to Little Moose Lake. It is one of the most remote and least used trails in this part of the Adirondacks. The trail is mostly level and will give hikers solitude in a true wilderness setting. To reach the trailhead requires a long drive on rough dirt roads deep into the Moose River Plains, past the remote Otter Brook and site shown as Kenwell's on some maps. This is not a trail for the novice hiker with its remoteness, difficult crossing of Otter Brook and blowdowns along this wilderness path which was once an old logging road. The trailhead is 3.3 miles south of the T intersection on Otter Brook Road. The trail starts just past the Otter Brook Road bridge over Otter Brook, where Indian Lake Road goes right the Otter Brook Pond Trail goes left. There is a new vehicle barrier placed closer to the junction with the dirt road. The Otter Brook Pond Trail begins here. The trail crosses Otter Brook at 4.0 miles. There is no bridge here. You will need to wade across the stream, which is at least a couple of feet deep or at times even deeper with a pretty good current. At 6.3 miles you reach the junction of the Lost Pond Trail on the right, which leads one mile to Lost Pond and 2.2 miles to Cedar Lakes. The Otter Brook Pond Trail continues straight here. At 9.4 miles reach the former Little Moose Club parcel. The land became state land in 2007 and this area is now known as Little Moose Wilderness area. At 9.9 miles reach the outlet of Little Moose Lake, which is spills over a dam. This is actually the start of the South Branch of the Moose River. At 10.5 miles you reach a good spot to camp on Little Moose Lake. There are easier ways to hike to Little Moose Lake. This is easily the most difficult route to the remote Little Moose Lake. 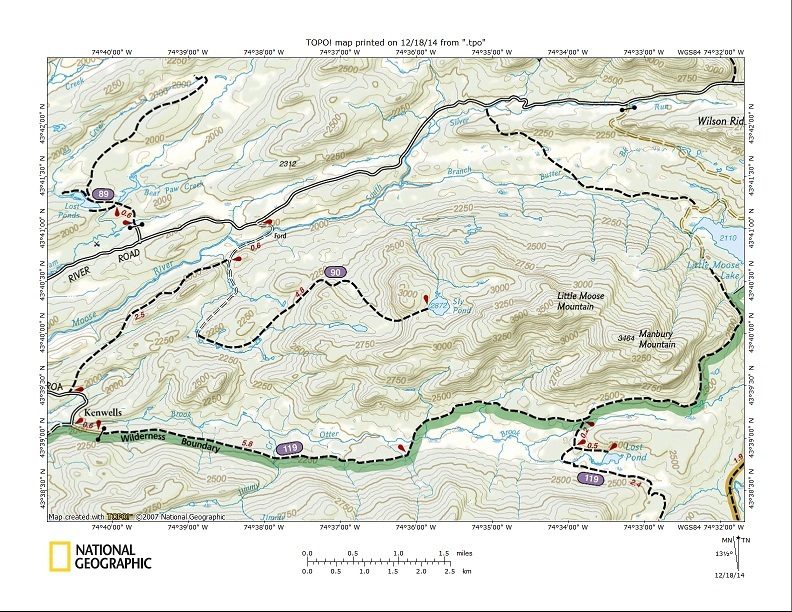 The Otter Brook Pond Trail is the trail that follows the wilderness boundary on the map below.